Fear. Photo by Corey Smith. Celebrating their 40th anniversary, Los Angeles punks Fear took the stage to a joyous applause from the crowd. I only saw two or three mohawks, but punks young and old were out in force. The band ran through songs from their classic albums The Record, More Beer, and Have Another Beer with Fear, while the mosh pit grew with each successive song. Original members Philo Cramer (guitar) and Spit Stix (drums) joined vocalist/guitarist Lee Ving about midway through the set. Songs like “Foreign Policy” seemed as relevant today as when it was first written, while “New York’s Alright If You Like Saxophones” and “I Love Livin’ In The City” triggered the older crowds nostalgia to new heights. While the band doesn’t have the reckless abandon they possessed 40 years ago, they’ve still got plenty of angst coursing through their veins. Ving’s vocals were strong and articulate and the band did justice to the material that has been marinating in the underground punk culture for nearly four decades. If you get a chance to see Fear on this historic anniversary, don’t miss it. 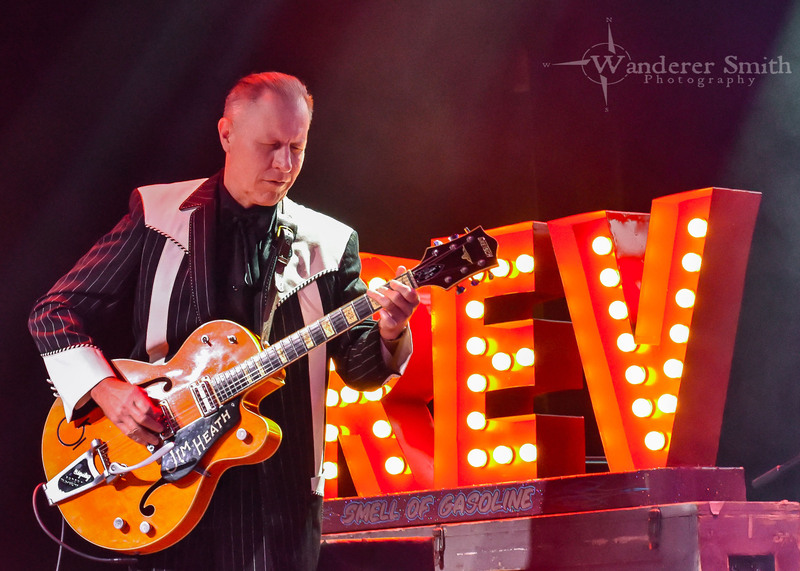 Reverend Horton Heat. Photo by Corey Smith. The Rev played an absolutely epic set. Featuring old songs, fan favorites, some covers, and few new ones from their forthcoming album, the band was typically excellent. They also featured a new member, Matt Jordan, on piano and keys. Dependable as always, the Rev and his new quartet were flawless. Heath’s guitar playing is always smooth and crisp and last night was no exception. He was also in a particularly good mood, sharing stories of him and bassist Jimbo Wallace getting in a fist fight in a restaurant parking lot, and other stories of the early days of the band. Jimbo, of course, was quietly superb as he and former 1100 Springs and Brave Combo drummer RJ Contreras held down the rhythm. Contreras is a fantastic drummer and if you were at all worried about who would replace Scott Churilla, rest assured that Contreras fits in perfectly. The new guy in the band, Jordan, added a wonderful dimension with his piano playing. While we’re more than comfortable with the Rev’s typical three-piece lineup, Jordan’s playing sounds like it should’ve been there the whole time. The excellent sound at Gas Monkey helped. His playing was never muddled in the mix, but rested perfectly alongside the other instruments. Following two punk bands, the Rev commanded the crowd with ease. During the faster tempo songs, there was moshing. During the mid-tempo songs, a few couples even danced. Their cover of Motorheads “Ace of Spades” made everyone happy as they played a fairly straight-forward version that undeniably had the Horton Heat stamp. Playing around 90 minutes, the band left no stone unturned. There are few bands as reliable as the Rev – and that’s why they always draw a great crowd. Speedealer. Photo by Corey Smith.